Newcomer Family Obituaries - Grace J. Recknagel 1922 - 2019 - Newcomer Cremations, Funerals & Receptions. Grace Josephine (Meyer) Recknagel was born November 8, 1922 to Joseph L. and Pearl (Griffin) Meyer. Born in Point Place, Ohio, she had three brothers and one sister. Grace grew up in Elmore, Ohio where she graduated from Harris-Elmore School in 1940. Grace married Fred Recknagel, who served in the Sea Bees in WWII, on December 25, 1943, and they were blessed with six children: Fred III (Susan), Teddy, Timm, Ken, Dan (Sue), and Laura (Lawrence Langton). She had nine grandchildren, Ayda, Tedd, Andrew, Lyndsay, Jordan, Stephen, Kassidy, Sara and Iain, as well as great and great-great grandchildren. While raising her children, Grace served as a Den Mother for 10 years in Boy Scouts Pack 164 sponsored by St. Lucas Lutheran Church. She actively participated in the Parent-Teacher Organization at both Westfield and Jones Schools and served as President numerous times. Grace taught Sunday School at St. John’s Lutheran Church from 1944 to 1968, and at Bethel Lutheran Church from 1968 to 1990. She was also a member of the church choirs, and the Bethel Bell Choir for many years. Grace served on the National Board of American Lutheran Churchwomen for three years and was active in leadership roles on the local and regional level as well. She was a member of the Ohio and National Association of Parliamentarians from 1980 until 2015 and served on the State Board for 18 years. Grace was the Parliamentarian for the Northwest Ohio Synod of Evangelical Church Women of America from 1977 to 2015. One of the volunteer jobs she enjoyed the most was working for Mobile Meals. 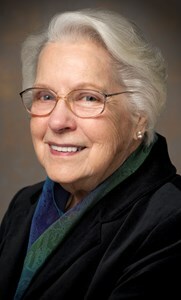 Grace was a board member from 1988 to 1998 and served as their president in 1997 and 1998. She delivered meals through 2005 during which time she felt honored and blessed to meet so many wonderful people. Grace was a certified tutor and a certified trainer for the Toledo Lucas County Library READ for Literacy program, and in October of 2017 awarded for her 30 years of service teaching English as a Second Language. Right up until her passing she continued to work with some of her students and had remained close friends with almost all her students over the years. She took pride in being an American Red Cross 10 Gallon Blood Donor. The family will receive guests on Monday, March 25, 2019 from 5 – 8:00 p.m. at Newcomer – Southwest Chapel, 4752 Heatherdowns Blvd., Toledo (419-381-1900). A Memorial Service to honor Grace will be held on Tuesday, March 26, 2019 at 11:00 a.m. at Bethel Lutheran Church, 1853 South Ave., Toledo, OH 43609 (419-385-5339). Inurnment will be Private. Those wishing to make memorial contributions are asked to consider Bethel Lutheran Church. To share a memory of Grace or to leave a special message for her family, please click the "Share Memories" tab above. Add your memories to the guest book of Grace Recknagel. My name is Nilay , from Turkey.I want to share my feelings and condolences. I used to live in Toledo between 2004-2006.Thank God,I met Grace. She was my tudor, beyond that she became sometimes my mom, sometimes one of my best friends.We both were coming from different religions, different regions, different cultures.But we loved and respected each other,she will always my guide in my life.I wish i could see you once again Grace.I will always miss you. I am Grace's first student. Not only she helped me with English, but she also introduced me to God. I eventually accept God as my savior. I moved a lot in the past 20 years but never lost contact with Grace. The last time I called her was early March. She could not hear me very well, but she was still kind, composed and caring. My dear grandma Grace, love you so much. It was truly a blessing to know you and have you in my life. We will eventually meet in Heaven. Please save a seat for me next to you. Now and in the days ahead, may Jesus our God of comfort hold you all in the palm of His hand and richly bless you as you remember and celebrate Grace's life legacy. Her memory will live on in the hearts of all who knew her. 'And He will raise you up on eagles' wings; bear you on the breath of dawn; make you to shine like the sun, and hold you in the palm of His hand'.